Your spinal cord, spinal nerves that travel to your arms and hands, and arteries that supply blood travel through the protective cervical spinal canal. The top section of the cervical spinal canal is very spacious. It allows more room for the spinal cord than any other part of the vertebral column. The extra space helps to prevent pressure on the spinal cord when you move your neck. An Electromyography (EMG) test is often done at the same time as the NCV test. An EMG measures the impulses in the muscles to identify nerve problems. Healthy muscles need impulses to perform movements. 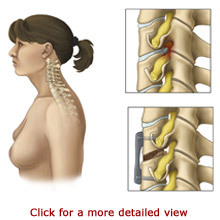 Your doctor will place fine needles through your skin and into the muscles that the spinal nerve controls. Your doctor will be able to determine the amount of impulses conducted when you contract your muscles. The EMG may be uncomfortable and your muscles may remain a bit sore following the test. The recovery process is different for everyone. It depends on the type of surgery that you had and the extent of your condition. Your surgeon will let you know what to expect. 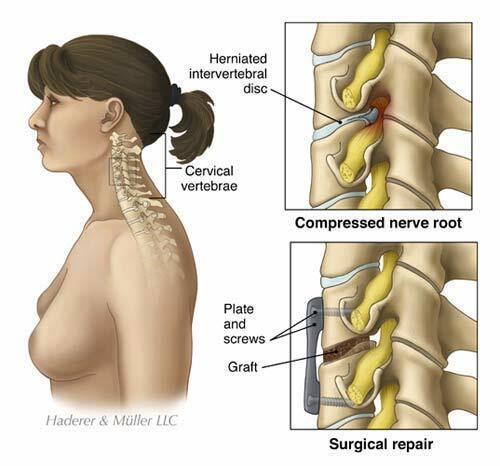 Generally, the recovery time for an Anterior Cervical Discectomy and Fusion is several weeks. Your arm pain should go away fairly quickly however, it may take weeks to months for your arm weakness and numbness to resolve.